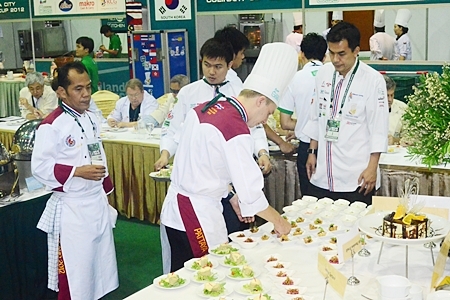 Top hotel chefs from nine countries joined Thailand’s best culinary artists for the 6th Pattaya Food & Hoteliers Expo. 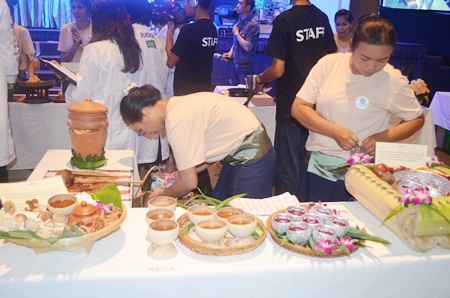 The July 26-28 event at the Peach Convention Center in Jomtien Beach featured nearly 20 contests in everything from fruit carving and drink-mixing to deserts and Thai set menus. Cooking contests pitted professional chefs against each other and offered opportunities for rising university stars to try their hand at deserts, plate arrangement, Thai and European dishes, flower arranging and cocktail mixing. 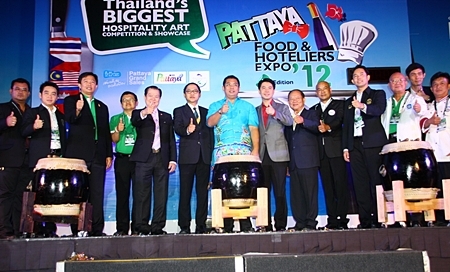 Sonthaya Kunplome, former Minister of Tourism and Sports, and Pattaya officials launch Pattaya food & Hotelier Expo 2012. 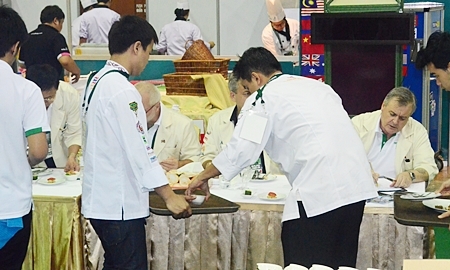 In its second year, the Culinary Cup international chefs competition with teams from Australia, Cambodia, Czech Republic, China, Hong Kong, Malaysia, Singapore, South Korea, Taiwan squaring off against their Thai counterparts under the watchful gaze of the World Association of Chefs Societies. 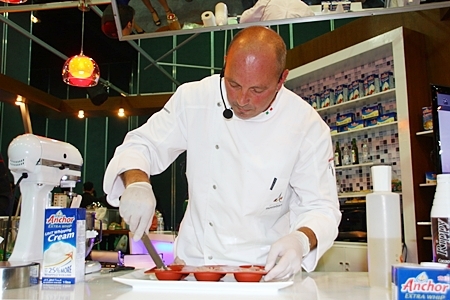 Fifteen teams of five chefs worked just under six hours in the “gourmet seafood challenge” to prepare a main course for 10 people using a “mystery protein” Thai herb followed by 11 menus of gourmet live seafood buffet containing salad, appetizer, tapas, soup, main course and dessert. Bakery chefs demonstrate the best way to make thick, creamy desserts. The Hong Kong team, despite being delayed in the airport for 16 hours by bad weather, won the 1st place HRH Princess Sirindhorn Trophy and $3,000. 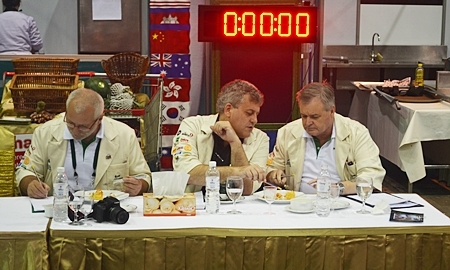 Australia’s team finished second and the Czech Republic third. 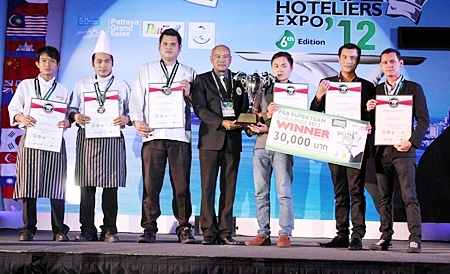 Thailand’s best showing came from the Pattaya team, which finished sixth. In the Thailand competition, the Long Beach Garden took top honors overall, with the Royal Cliff Hotels Group and The Zign Hotel and Centara Grand Mirage Beach Resort turning in strong performances. Among showcase competitions, the Royal Cliff won the Food & Beverage Super Challenge with Centara second and The Zign third. 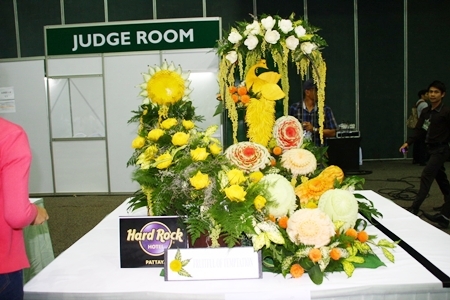 Hard Rock Pattaya Hotel’s entry in the flower arrangement contest. 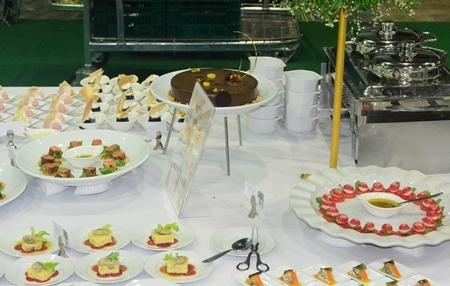 Long Beach Garden took first in the tapas display category and the top two places in bed-making competition. The Royal Cliff and Dara Samui took second and third in the tapas contest while the dusitd2barquada placed third in bed-making. Students from the Dusit Thani College won the Thai-Western Fusion Competition with the Marriott Pattaya Resort & Spa placing second and The Zign third. The Zign and Dusit College traded places the wedding cake decoration category, while Impact won third. 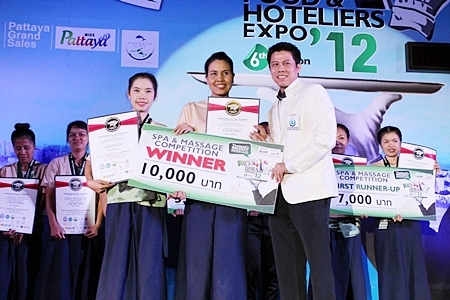 Centara was the only hotel to place in the spa competition, winning first over the Na Spa and Spa Silvadee. 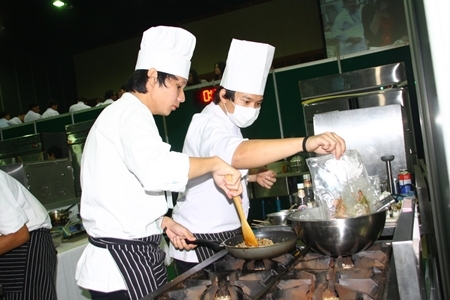 And in the young chef competition, The Zign placed first, followed by Centara and Woodlands Resort. The event, sponsored by Pattaya, Chonburi Province, the Tourism Authority of Thailand, Pattaya Chefs Association, Eastern Housemaid Administration Club, Thai Eastern Food Administrators and Beverage Association, was also a venue for more business representatives to display food and beverage products, tools, equipment and household items used in the hotel and restaurant industries. Next articleSuperSight Surgery – Read all about it! Without glasses!